Last Saturday (June 9), I attended the “Lessons of the Red States Teacher Strikes” forum featuring teacher leaders of the mass education strikes in West Virginia, Kentucky, and Arizona. The forum, held in Oakland, California at a local public high school (Oakland Tech) was organized by the Oakland teachers’ union and co-sponsored by the San Francisco, Berkeley and Richmond (California) teachers’ unions. Here are my impressions and observations about this event. 1. The speakers were inspiring, individually and collectively. The women – all four are women – were courageous, resolute, and brilliant organizers. Most readers will probably already know this from the widespread coverage of the red state strikes. If not, I think that this summary, brief as it is, will make this clear. 2. The stated aim of the event was to learn how the red state organizers had carried out the most impressive labor actions in decades despite what had hitherto been considered insurmountable obstacles – weak state unions, anti-strike legislation, lack of collective bargaining, no dues check-off – and to build on these to launch coordinated local and / or statewide actions in California. The organizers had anticipated filling Oakland Tech’s 800-seat auditorium and hoped for a large turnout from younger teachers and community, based on the overwhelmingly positive response to the red state strikes. But only somewhere between 200 and 300 showed up, very few under 50 years old. The majority were veteran Bay Area leftists. 3. In any event, the talks by the red state teacher leaders were inspirational as well as educational. They each talked about how they were able overcome anti-strike legislation and build mass strikes despite the weakness of state and local unions. In all three states – West Virginia, Kentucky, Arizona (and I believe that this was true in Oklahoma and North Carolina too) – the organizers worked outside of the formal union structures, using social media to reach out to, and build networks of, initially hundreds, then thousands, and now tens of thousands (For example: ongoing networks of 24,000 in West Virginia, and of 55,000 in Arizona.) Although the core of these organizations are schoolworkers and have developed networks of school leaders at the local and school levels, they don’t restrict their membership to teachers: The networks include both union members and non-members; public school teachers and charter school teachers; certificated staff (teachers) and classified staff (clericals, janitors, food service workers, etc.). 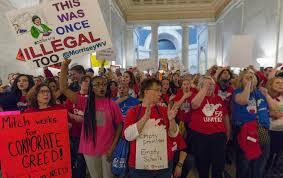 They don’t restrict themselves to traditional union issues, or even to strictly educational issues – for example, the West Virginia teachers demanded and won a 5% across the board pay increase for all West Virginia public employees, not just teachers, while one of the key issues taken up by the Kentucky movement is how to address gang violence. Rather, to reemphasize at the risk of redundancy: the key lesson here is the importance of building what could be called “classwide organizations” – organizations that operate inside and outside the workplace, that include union members and non-members, teachers and non-teachers; that take up educational and non-educational issues (e.g., environmental issues); etc. An equally important lesson is to not be constrained by the fear of strikes being labeled “illegal”. If the organization is strong enough, with enough support among school workers and enough support in the community, the courts and the legislature are likely to fold – as they did in the red state strikes. • CTA pulled the plug on its 2003 initiative to reform California Proposition 13 to tax corporate property more heavily (they caved to pressure from the Chamber of Commerce, who behind the scenes threatened to go after dues check-off). • The “progressive” leadership of the Los Angeles teachers union called off a walkout of tens of thousands of teachers when a judge issued an injunction with fines of $1 million / day if they struck. • In 2009, CTA sent staff from district to district, warning local unions to accept downsizing, including layoffs, in order to “protect our contractual gains” – i.e., wages and benefits. The red state strikes show that there’s another way, a better way: organize to fight, for a classwide fight, an inclusive fight around classwide demands, rather than meek, legalistic acquiescence. a. Mass media contrasts teacher salaries in California with those in the red states and implies – or states outright – that strikes occurred in those states because teacher pay was so low. But when adjusted for inflation, average pay in California is not much higher than in, say, West Virginia – and average pay in several large urban districts (e.g., Oakland) is actually lower than the average in the red states. Moreover, the red state strikes were not just about teacher pay: a key unifying demand was more money for education. The mass media implies that California and other “blue” states put much more money per capita into education than the red states. Not so. California, despite having the fifth largest economy in the world (behind only China, the U.S., Germany and Japan) is 41st of the 50 states in education spending per capita – well behind, for example, West Virginia. b. The red state strikes blow apart the “lesser evil” argument in multiple ways: First, many strikers actually were / are Trump supporters, and see him as shaking up the status quo that has brought them lower wages, insecurity, raised their rents, taken away their homes, left their family members jobless and their children with poor prospects. Second, in blue states like California, the Democrats – far from being the opponents of privatization, charter schools and downsizing that they’ve been made out to be in the mass media, have been its advocates. Take the example of Oakland, where I taught and was active in the teacher union. For the past 20 years, Oakland has been ground zero in the assault on public education. In 2003, the state put the Oakland public schools in receivership, a move orchestrated by Los Angeles billionaire Eli Broad (supported by his billionaire friends Reed Hastings and John Doerr) and his long-time ally, then- Oakland mayor and now California governor Jerry Brown. Broad, Bill Gates and company turned the Oakland schools into a laboratory for privatization: under the state takeover enrolment in charter schools more than quadrupled while enrollment in public schools fell by one-third; the state moved in ostensibly because of a $37 million budget deficit, and left seven years later after tripling it – turning it into a $110 million debt, which to this day the state insists that the district must repay in full with interest; more than half the schools in Oakland were closed or reorganized, the libraries were shut down in nearly all middle schools and in several high schools, custodial workers were laid off, etc. Under the state takeover, Oakland had per capita double the rate of outsourcing to private contractors and double the administrative overhead of the average California school district. While Oakland was a laboratory, the Democrats nearly everywhere supported the policies of downsizing, charter schools, test-based accountability, school closures, outsourcing, and privatization. The assault on public education was bipartisan – its most ardent advocates included Massachusetts Senator Ted Kennedy and California Congressman George Miller (the two leading proponents of the No Child Left Behind legislation), and President Barack Obama and his education secretary, Arne Duncan. It’s also important to consider that in the “red states” Republican legislators responded to mass pressure by at least partially caving, fearing that they’d lose their jobs and their legislative majorities in the next elections. But in “blue” California, the Republican Party has nearly collapsed in the most populous parts of the state. The Democrats have lockdown control of the state legislature as well as the governor, and they have little fear of losing same. So they feel little constraint to do more than pay lip service to education, and can be expected to continue the same policies that they have for decades: providing inadequate funding for education (again: California ranks 41st of the 50 states in that regard); supporting charter schools (or whatever comes down the pipe in place of charter schools, should the bloom come off that rose); supporting test-based accountability (or whatever repressive variant comes down that pipe); supporting state takeovers of local school districts, thus taking control out of the hands of the public (just as charter schools do – charter schools receive public funding but are privately controlled). Is it any wonder that so many working class folks have been repelled by the Democrats’ austere neoliberalism, and that at least some have turned to Trump? 6. Problems: Where do the red state strike organizers go from here? They know that they need to consolidate their gains and to spread them nationally. But who can they reach out to? They look to who they see – ostensible “progressive” locals, like Oakland and San Francisco and Los Angeles. But the teacher leaders in the sponsoring locals have a past and present connection to CTA and its policies. And their own records. It’s important to see things as they really are. That can be a downer. So far too often, far too many leftists act as cheerleaders and, willfully or not, wind up contorting and distorting facts to fit their desires. Thus, Jeff Mackler, national secretary of the group Socialist Action, recently wrote an article hailing the Oakland teachers’ union (OEA) as the most militant teacher union in the country, saying that the union has launched five strikes over “the past decades”. Well, yes – if you go back far enough. But over the past 22 years, OEA has gone out for exactly one day, and the OEA officers and CTA staff resisted even that. And OEA has been far from the worst – inadequate as it’s been, it’s still far better than most. Now, I don’t want to write off the newly elected OEA leadership out of hand. But they – and the other local union officials – are not going to act much differently than in the past UNLESS there’s an eruption from below. We certainly shouldn’t look to CTA or NEA or AFT to take the lead. Quite the opposite, as we’ve argued above. And I’m not hopeful about the local leaders, either. Maybe some will be on the right side – but I think that if that happens, it will be because they will be reacting to motion from below, not taking the lead in unleashing it. 7. Meanwhile: How to proceed in places like Oakland, where the teacher union has been out of contract since last June. And in other California school districts – especially large urbans. First: Build a network, if possible with contacts in every school in your district. This has been a foundation for building towards strikes in the past: in Chicago in 2012; in Arizona earlier this year; etc. In the past, this has been best done by releasing several teachers from classroom duties temporarily to go from school to school, holding school meetings, making contacts, identifying teachers who can act as shop stewards / representatives for their schools, etc. Based on the red state teacher experiences, this probably ought to be combined with social media outreach. That’s a pretty clear statement of class collaboration, isn’t it? Weingarten says to the ruling class: “Look out below. We union bureaucrats are what’s standing between you and the wrath of the masses.” In that regard, we should recall that the storied labor mass militancy of the 1930s was largely carried out, successfully, without collective bargaining and often “illegally”. And now the same is true for the red state teacher strikes. That should at least give us pause, and cause to think further about the deal that brought about labor peace at the end of the 1930s, exchanging collective bargaining and a piece of the pie for no-strike contracts, no-strike pledges, and permanent state intervention and regulation of labor. Dues checkoff is double edged: the Janus case is part of a virulent right wing attempt to destroy unions, period. And this is something that we all need to oppose. But we need to be aware that if Janus is defeated, the union leaderships will continue with their course of using members’ dues to strengthen their bureaucratic stranglehold and to try to keep their foot on the neck of potential militant struggle. I think that the red state teacher strikes, and particularly their alternative forms of organizing and organization, inside and outside the unions, and their classwide membership and demands, poses an important alternative model. It’s one that we need to try to work with and deepen. We need to all look at ways to broaden and sustain such a model – hitherto, the model has been inspiring during the upsurge (e.g., the first few months of Occupy) but has not endured. Unions, on the other hand, have been able to consolidate the gains won in strikes and other contract struggles – but have done so by strengthening a central bureaucracy and by more and more collaborating with management and integrating with the state.